NeighborWorks Northeastern PA : News & Events : Articles : Over The Edge and going again! Over The Edge and going again! 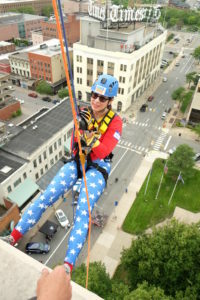 First-ever Over The Edge Scranton a rousing rooftop success. 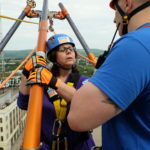 As part of the national celebration of NeighborWorks Week 2016, NeighborWorks Northeastern Pennsylvania sent almost 50 adventurers over the edge of the tallest building in Scranton, the Bank Towers Building at 321 Spruce St., on June 10 and 11. Mother Nature cooperated to deliver two perfect days that left rappellers and onlookers buzzing about the challenge they’d just taken on or the ground-level excitement they’d just witnessed. NWNEPA teamed up with Over The Edge USA, a national event company that works with nonprofit organizations, and presenting sponsor Gibbons Ford to bring this first-of-its-kind rappelling adventure to Scranton, and nearly 40 people representing the business, educational, medical, legal and religious communities, signed on to raise a minimum of $1,000 for the cause by promising to take the 146-foot leap. Another 10 rappelled the day before the main event, representing sponsors and local media. Gibbons Ford was on hand Friday and Saturday, sending four rappellers, Casey and Kurtis Medeiros, Lisa Gormley and Kate Webster, over the edge on Friday and another, Kate Grow, on main-event day. Other major event sponsors also sent representatives to the event and off the roof. 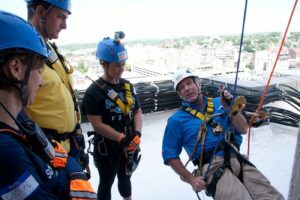 Geisinger Chief Administrative Officer Lisa Golden rappelled on Friday while an entourage from Geisinger cheered her on from the streets below. NeighborWorks America sent three representatives from Washington, D.C., and New York City to the event. Andy Blomme, senior director of legislative affairs for NeighborWorks America, rappelled on Friday, while Susan Jouard, senior regional public affairs and communications advisor, served as cheerleader. Christina Deady, director of Leadership and Workforce Development Programs for NeighborWorks America, rappelled on Saturday dressed in a Ninja suit. Two other rappellers also took the plunge in costume. Laura Agostini of The Foley Law Firm rappelled as Wonder Woman, and Michael Stanton of Bold Gold Media wore his Jose The Dysfunctional Leprechaun outfit. DJ Prospector of Rock 107 also took the rooftop plunge, as did Ian Lopera and reporter Joe Kohut of the Times-Tribune. All told, this innovative fundraiser was a tremendous success, one NeighborWorks NEPA intends to repeat next year. Thirty-eight registered rappellers raised a total of $49,814 by creating a profile on www.crowdrise.com/neighborworksnepa and asking for support from within their personal networks. Corporate and organizational sponsors contributed another $17,175, bringing the fundraising total to $66,989. Comments received from rappellers were all positive, with several thinking ahead to next year. OTE 2017 will take place on June 2 and 3. In a note to NWNEPA, Collins added that Community Bank hopes to form a rappelling team for next year’s event. Local author and teacher Barb Taylor and Rosenn Jenkins & Greenwald LLP partner Tim Maloney shared similar sentiments on social media. “Can’t believe how much fun this was,” Taylor wrote. “Can’t wait to do this again next year,” Maloney wrote. Spectators at the main event enjoyed breakfast and lunch selections from four on-site food trucks and a ground-level celebration that included party and personalized rappelling music by Mike Walton Productions, an instant photo booth and a children’s craft area. The Holy Cross High School cheerleading team, wearing “Team Tolerico” shirts, was on hand the entire day not only to cheer for their rappelling principal, Ben Tolerico, but to provide all-day entertainment and support their principal’s fellow rappellers. All money raised will support NWNEPA’s mission to build stronger, more sustainable neighborhoods by providing crucial home-repair services to elderly, disabled and disadvantaged homeowners throughout Northeastern Pennsylvania. The funds raised flowed directly back into the community beginning July 4, as NeighborWorks Northeastern Pennsylvania staff and volunteers and adult leaders from the national GroupCares team once again descended upon West Scranton for the local service-oriented celebration of NeighborWorks Week. Teams of volunteers painted home interiors and exteriors, repaired porches and built a wheelchair access ramp. Special thanks to the other Over The Edge event sponsors – North American Warhorse, Highmark, Citizens Savings Bank and Grimm Construction Inc. – as well as to in-kind sponsors Access Aerial, The Hilton Scranton and Times-Shamrock Communications. NWNEPA also recognizes and thanks Bank Towers building owners Jerry and Joseph Ferrario, the youth philanthropy organization OurDash, which volunteered on a number of pre- and post-event tasks, the 40-plus community volunteers who tended ropes, took registrations or performed other critical event-day tasks, and Schiff’s Restaurant Service and the North Scranton and Mulberry Street locations of Domino’s Pizza, which made food and beverage donations. We can’t wait to do this all again! Stay tuned for full details. Meanwhile, watch our event video below and please consider joining us next year!